A sister group relationship between these two taxa was recognized only recently (Chap. 3), and the fossil record is still in need of a thorough revision in the light of this new hypothesis. Flamingos and grebes distinctly differ in many osteological features, and statements about character polarity are aggravated by the fact that the sister taxon of the clade (Phoenicopteriformes + Podicipediformes) is unknown. Crown group Podicipediformes are rather short-legged, foot-propelled diving birds with a global distribution. They have no published Paleogene fossil record, although Kurochkin (1976) mentioned specimens from the late Oligocene of Kazakhstan. Vickers-Rich (1991) also indicated the existence of undescribed Podicipediformes from the late Oligocene or early Miocene of the Namba Formation of Australia. The earliest described grebe is Miobaptus walteri Svec, 1982 from the early Miocene of the Czech Republic (Svec 1982, 1984). Because this species already exhibited the highly derived osteological features of modern Podicipediformes, it indicates a Paleogene stem lineage which probably originated on one of the southern continents (see also Olson 1989). Crown group Phoenicopteriformes are characterized by greatly elongated hind-limbs and a derived beak morphology. Both features constitute adaptations to filterfeeding in shallow saline lakes. Apart from some late Cretaceous remains of highly doubtful affinities (Olson and Feduccia 1980b), the earliest fossils that were assigned to the Phoenicopteriformes belong to the middle Eocene Juncitarsinae, which include two named species (Olson and Feduccia 1980b; Peters 1987a). Juncitarsus gracillimus Olson and Feduccia, 1980 from the Bridger Formation of Wyoming is known from a number of isolated bones, including a complete tarsometatarsus. J. merkeli Peters, 1987 is based on a fairly complete but rather poorly preserved skeleton from Messel; Peters (1987a) also tentatively assigned to this species hindlimbs from the Green River Formation. The distal humerus referred to Juncitarsus by Olson and Feduccia (1980b, Fig. 28) closely resembles that of a putative "graculavid" described by Boles (1999, Fig. 2) from the early Eocene Tingamarra Local Fauna of Australia. This specimen was compared with the Presbyornithidae by Boles (1999), from which it, however, differs in the shorter flexor process. considered it to have been schizorhinal, in which case the beak morphology of Juncitarsus would even depart from that of both extant Podicipedidae and Phoenicopteridae, whose beaks are holorhinal. However, the bill of the holotype specimen is crushed and the exact caudal extent of the nostrils is difficult to ascertain. This leaves the possibility that the nostrils of Juncitarsus were just very long as in the Palaelodidae (see below). In concordance with extant Phoenicopteridae, the frontal bones of Juncitarsus exhibit fossae for salt glands (Olson and Feduccia 1980b), and the tarsometatarsus is extremely elongated and slender. After recognition of a sister group relationship between the Phoenicopteriformes and Podicipediformes, the phylogenetic affinities of Juncitarsus are in need of revision. As shown by Mayr (2004a), the taxon lacks derived characters shared by extant Phoenicopteriformes and Podicipediformes. In particular, the proximal phalanx of the major wing digit is not as narrow, and the hallux is proportionally longer. Peters (1987a) further noted that the notarium of Juncitarsus consists of only two vertebrae, which would be a smaller number than in extant flamingos and grebes. Apart from the greatly elongated legs, no derived feature has been described which is exclusively shared by Juncitarsus and extant flamingos but absent in grebes. I thus consider it well possible that the taxon actually is a stem group representative of the clade (Podicipedidae + Phoenicopteridae). Olson and Feduccia (1980b) remarked that the phylogenetic affinities of the putative phoenicopteriform Elornis littoralis Milne-Edwards, 1867 from the early Oligocene of France cannot be established, so much the more so as the whereabouts of the specimens, various crushed postcranial bones in slabs, is unknown. The material includes a very long and slender tarsometatarsus, which suggests that at least some of the bones may indeed belong to a phoenicopterifom bird. As noted by Mlikovsky (2002, p. 255), the figured tibiotarsus is, however, quite different from that of the Phoenicopteriformes. S everal late Eocene and early Oligocene specimens of putative Phoenicopteriformes were assigned to the taxon Agnopterus, which was originally established for Agnopterus laurillardi Milne-Edwards, 1867 from the late Eocene (MP 19) of the Paris Gypsum. The assignment of this species is based on an incomplete distal tibiotarsus (see also Brunet 1970). A coracoid from the late Eocene (MP 17; Mlikovsky 2002) of England was described as ?Agnopterus hantoniensis by Lydekker (1891), who tentatively referred it to the Phoenicopteriformes (Fig. 10.1). Harrison and Walker (1976a, 1979a) assigned humeri and a scapula from the late Eocene and early Oligocene of England to this species and classified it into the new taxon Headonornis, which they considered to be an Old World representative of the anseri-form Presbyornithidae. Dyke (2001b) even concluded that the humeri referred to ?A. hantoniensis by Harrison and Walker (1979a) actually belong to Presbyornis isoni (Sect. 6.4.3). There is, however, no convincing reason to disassociate these bones from the coeval and similarly sized coracoids, and assign them to a species that lived some 20 million years earlier on a different continent (Mayr 2008f). Mlikovsky (2002) classified ?A. hantoniensis into the Anseranatidae. The coracoid is, however, very similar to the corresponding bone of the Palaelodidae (Fig. 10.1), and I consider ?A. hantoniensis to be a stem group representative of the Phoenicopteriformes. A proximal femur from the late Eocene type locality, which was described as a member of the Threskiornithidae ("Gigantibis incognita") by Harrison and Walker (1976a), probably also belongs to ?A. hantoniensis (pro Lydekker 1891, contra Harrison and Walker 1976a). The same may be true for fragmentary remains of putative Phoenicopteriformes from the late Eocene of England (Harrison 1971). Basin in Brazil (distal end of a tibiotarsus; Alvarenga 1990). Although these seem to have been correctly assigned to the Phoenicopteriformes, the species are based on too fragmentary material for a reliable taxonomic assignment within the group. From the late Oligocene or early Miocene of the Australian Etadunna Formation Miller (1963) described two species of the Phoenicopteridae as Phoeniconotius eyrensis and Phoenicopterus novaehollandiae. Both are known from leg bones and were assumed to have had a better developed hallux than extant Phoenicopteriformes, which also suggests a position outside the crown group. 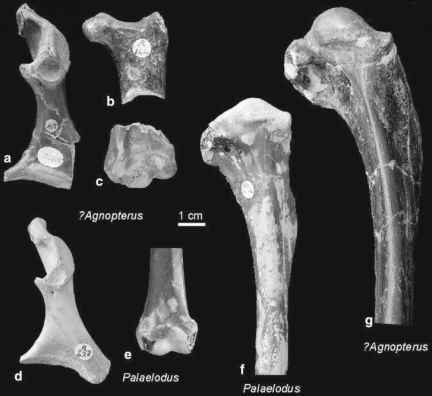 Whereas the fossil record of the above species is quite limited, numerous bones of Harrisonavis ("Phoenicopterus") croizeti (Gervais 1852) were found in the late Oligocene and early Neogene of France. This species closely resembles crown group Phoenicopteridae, but the beak is still less downcurved than that of its extant relatives (Harrison and Walker 1976d). Of particular interest with respect to the well-established sister group relationship between the Phoenicopteriformes and Podicipediformes are the Palaelodidae. These distinctive birds have long been recognized as stem group representatives of the Phoenicopteriformes, and markedly differ from the Juncitarsinae in limb proportions, most notably the much shorter tarsometatarsus. The earliest fossils assigned to the taxon come from the early Oligocene of Belgium (Mayr and Smith 2002a) and belong to a fairly large bird, which was described as Adelalopus hoogbutseliensis Mayr and Smith, 2002. Rasmussen et al. 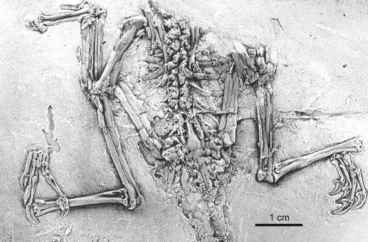 (1987) further reported bones of Palaelodus-like birds from the early Oligocene of the Jebel Qatrani Formation in Egypt. In the late Oligocene of France, three species of Palaelodus coexisted, which are very abundant in early Miocene deposits of Europe, i.e., P. ambiguus Milne-Edwards, 1863, P. crassipes Milne-Edwards, 1863, and P. gracilipes Milne-Edwards, 1863 (Hugueney et al. 2003; Mourer-Chauvire et al. 2004; whether Mlikovsky 2002 rightly regarded these as representatives of different size classes of a single species P. ambiguous needs to be scrutinized). Two species of Palaelodus, P. wilsoni and P. pledgei, were described by Baird and Vickers-Rich (1998) from the late Oligocene/early Miocene Etadunna Formation in Australia (see also Boles 2001b). Bones of Palaelodus cf. ambiguus were further identified in the late Oligocene/ early Miocene of the Taubate Basin in Brazil (Alvarenga 1990). Whereas early Oligocene remains of these birds are as yet only known from the Old World, palaelodids thus appear to have achieved a worldwide distribution in the late Oligocene. Palaelodus has a short beak with a rounded tip, which was first misidentified as that of a representative of the Gruidae (see Cheneval and Escuillie 1992). The mandible is very deep, which suggests the existence of a thick tongue and a filter-feeding apparatus (Cheneval and Escuillie 1992). The tarsometatarsus is proportionally shorter than in extant Phoenicopteriformes and more mediolaterally compressed. In contrast to that in Juncitarsus and extant flamingos but in agreement with that in grebes, the hypotarsus further encloses canals for the digital flexor tendons. A presumably autapomorphic feature of the Palaelodidae is the presence of a marked cavity in the sternal extremity of the furcula, whose functional significance is unknown. Palaelodids have been unanimously considered stem group representatives of the Phoenicopteriformes, but recognition of a sister group relationship between the Phoenicopteriformes and Podicipediformes calls for a reinterpretation of the phylo-genetic significance of some of their features. In combining the deep mandibular rami of extant flamingos with leg bones that "show many similarities with those of a foot-propelled diving bird such as Podiceps" (in Cheneval and Escuillie 1992, p. 218) palaelodids provide a morphological link between the Phoenicopteriformes and Podicipediformes. It is, however, not straightforward to tell the character polarity of these features, i.e., which represent the plesiomorphic condition for the Phoenicopteriformes/Podicipediformes clade, and which are derived within that clade. Although palaelodids were regarded as specialized "swimming flamingos" by earlier authors (see, e.g., p. 209 in Feduccia 1999), it now appears more likely that the swimming adaptations, in particular the mediolaterally compressed tarsomet-atarsus, are plesiomorphic for the Phoenicopteriformes. Because both grebes and palaelodids are aquatic birds, which use their hindlimbs for propulsion in the water, it is most parsimonious to assume that the stem species of Pan-Phoenicopteriformes was also a rather short-legged bird, which utilized its feet for aquatic locomotion (Mayr 2004a). Species in the stem lineage of the Phoenicopteridae may then have entered a new ecological zone, as filter-feeders in shallow waters. Admittedly, the morphology of the long-legged Juncitarsus conflicts with this interpretation. If this taxon is indeed a stem group representative of the clade (Phoenicopteriformes + Podicipediformes) (see above), an alternative interpretation of the fossil record, which was not yet considered, would be a sister group relationship between the Palaelodidae and the Podicipedidae. In this case the phoenicopteri-form features of the Palaelodidae, such as the deep mandible which is absent in Juncitarsus, would be plesiomorphic for a clade (Podicipediformes + Phoenicoptrifo rmes) excluding Juncitarsus, and subsequently lost in the Podicipedidae. How old is the species palaelodus? Are flamingoes grebes and pigeons in the same clade?